The theme of Pope Francis' 2015 papal visit is "Mercy and Compassion" (Filipino: Habag at Malasakit). Efforts to invite Pope Francis to visit the Philippines were started when the pope was enthroned: Cardinal Luis Tagle personally requested the pontiff to visit the Philippines on the day of his inauguration as pope. In a pastoral letter dated 7 July 2014, the Catholic Bishops' Conference of the Philippines announced the theme of the papal visit, "A Nation of Mercy and Compassion." The theme was later shortened to "Mercy and Compassion". Philippine authorities planned to mobilize about 37,500 police and military personnel during the papal visit. 7,000 troops from the Armed Forces of the Philippines plus 5,000 reservists, 25,000 police officers and a 450-man security force which had recently returned from United Nations peacekeeping missions in the Golan Heights and Liberia were among those responsible for security during the visit in Manila, Tacloban and Palo. Snipers were also deployed in buildings along Roxas Boulevard in Manila. The Philippine government coordinated with Islamic State militant group. "We're touching base with so many allies to try and see... identify any threat whatsoever coming from any direction," President Benigno Aquino III commenting the country's coordination efforts with Interpol and other Southeast Asian countries. The Central Intelligence Agency of the United States and the Vatican has also sent intelligence agents to the Philippines to assess the security situation in the country ahead the papal visit. On January 22, it was revealed by Philippine authorities that a plot to detonate a bomb on the papal convoy by Jemaah Islamiyah was foiled weeks prior to the papal visit. The plan was foiled by the Armed Forces of the Philippines and the Philippine National Police. Along local authorities, the Swiss Guards tasked to guard the pope's personal security were also instrumental to the foiling of the plot. The plot was validated by intelligence counterparts from neighboring countries. Additional deployment to key areas by the military was made following the foiled attack. Part of the Light Reaction Company, which received training assistance from the United States, and military armored assets were deployed particularly during Pope Francis' mass at Luneta. Security forces also made changes to their preparation to mislead potential attackers. The foiled plot was also the reason for the intentional jamming of cellular signals around areas where the Pope visited. Concrete barriers being installed along España Boulevard ahead of Pope Francis' visit to the University of Santo Tomas. The Department of Public Works and Highways utilized at least 23,000 concrete barriers along the route the pope took around Metro Manila to restrain the crowd from blocking the pope's motorcade. Each barrier measures about 1.25 meters high, while some concrete barriers were borrowed from the North and South Luzon Expressways. During Pope John Paul II's visit to the country, devotees rushed into the streets slowing down or stopping the pope's motorcade. The measures to install concrete barriers were meant to prevent such kind of incident. 11,000 barangay officials and 5,000 parishioners from Manila formed as part of a human barricade to secure the pope. These 16,000 volunteers wore uniforms to differentiate themselves from the rest of the crowd. 5,000 students from the University of Santo Tomas also volunteered to become part of a human barricade during the pope's visit to the university. Filipina singer Jamie Rivera sang "We Are All God's Children", the official theme song for the Papal visit. The song's theme is about "humility" and "solidarity with the poor and mercy to the weak". A music video was made available to YouTube. 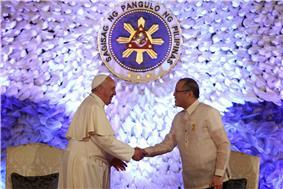 President Benigno Aquino III and Pope Francis at the arrival ceremony. Pope Francis, who came from a papal visit to Sri Lanka, arrived in Manila through Villamor Air Base riding a chartered Airbus A340-300 of the SriLankan Airlines , where he was welcomed by President Benigno Aquino III and several other government officials and church leaders. The pope arrived in the country at 5:32 pm PST about 13 minutes ahead of his expected arrival time. For 15 minutes, which started at 5:30 pm PST, all Catholic Churches around the country rang their bells as ordered by the Catholic Bishops' Conference of the Philippines head, Archbishop Socrates Villegas of Lingayen-Dagupan which signalled the pope's arrival in the country. The pope was welcomed at the air base by 1,200 students from different Catholic schools under the Diocese of Parañaque which covers the cities of Parañaque, Las Piñas, and Muntinlupa. A performance was done by the students for the welcoming dancing to the tunes; Piliin Mo ang Pilipinas sung by Angeline Quinto, Kapayapaan by Tropical Depression, and Sayaw ng Pagbati. The said songs are traditionally performed during Easter Sunday in Parañaque. Executive Secretary Paquito Ochoa, Jr.
Cagayan de Oro Archbishop Antonio Ledesma S.J. The pope then proceeded to the Apostolic Nunciature in Manila, which served as the pope's official residence during his stay in the country by an open-air popemobile. On his way to the nunciature, the pope was welcomed by thousands of people, devotees, and enthusiasts who were awaiting for his arrival. The pope rode a "close and more formal" Volkswagen Touran to the Malacañang Palace instead of the pope mobile due to the nature of his visit to the presidential palace. The pope still rolled down the window of the car to wave to people waiting to have a glimpse of him. He went to Malacañang as the head of state of the Vatican and had a courtesy call with President Benigno Aquino III at the venue. The pontiff met with diplomats and officials at the Rizal Memorial Hall. President Benigno Aquino III made a speech before the rest of the people in attendance at Malacañang including Pope Francis. On his speech, Aquino narrated his view on the role of the local Church in the recent history of the country. He acknowledged the major role the local Church played in opposing President Ferdinand Marcos and criticized undemocratic policies highlighted by Marcos' downfall following the aftermath of the People Power Revolution. However, Aquino criticized the local Church for its alleged inaction against "abuses" by "previous administrations" and for lobbying against the Reproductive Health Law even before its passage as a law. Aquino criticized the local Church for allegedly being over critical of him with some members of the local clergy "telling him to do something about balding hair". The president later changed his tone and praised the pope. The speech by Aquino later turned out to be controversial and drew mixed reception among netizens. After Aquino's speech, Francis made his first public speech of his Philippine visit and tackled the issue of corruption in the country. He urged that political leaders must adhere to "outstanding for honesty, integrity and commitment to the common good." He added that they must listen to the concerns of the poor and tackle the "glaring and indeed scandalous social inequalities" in society. The pope also called on Filipinos "at all levels of society, to reject every form of corruption which diverts resources from the poor, and to make concerted efforts to ensure the inclusion of every man and woman and child in the life of the community". The pope also hailed the resilliency of millions of Filipinos who were affected by Typhoon Haiyan. "This visit is meant to express my closeness to our brothers and sisters who endured and suffered loss and devastation caused by typhoon Yolanda," Francis said, using the local name of the typhoon. "I admire the heroic strength, faith and resilience demonstrated by so many Filipinos in the face of natural disaster," the pope added. The pope later rode the popemobile going to the Manila Cathedral to hold a Mass. Pope Francis, with Cardinal Luis Antonio Tagle, privately met with street children guided by the Tulay ng Kabataan Foundation at the Manila Cathedral for about fifteen minutes before he held a mass at the cathedral. This is after children from the foundation sent 1,000 letters requesting the pope to meet with them in person. The Mass which Francis held at the cathedral was closed to the public with only 1,500 selected people composing of bishops, priests, nuns and seminarians plus 500 laypersons. In his homily, Pope Francis highlighted the role of the Catholic Church in addressing the issues of inequality and injustice and leading the Philippine society from the "confusing presentations of sexuality, marriage and family." The attendees led by Manila Archbishop and Cardinal Luis Tagle welcomed the pope. Tagle also relates the history of the Cathedral, which was rebuilt numerous times after being destroyed numerous times due to natural and manmade calamities, to the resilience of the Filipino people. Authorities estimated that about 22,000 people stayed outside the cathedral during the mass; 12,000 at Plaza Roma and 10,000 in auxiliary streets. In an unexpected move, Pope Francis used the side doors, instead of the front door, of the cathedral as his exit after the Mass and walked towards Gen. Luna Street of Intramuros to visit the street children of Anak-TnK. The pope returned to the Apostolic Nunciature before heading towards the SM Mall of Asia Arena. A Filipino family displays one among many T-shirt designs that greeted the Pope's visit. ^ a b Placido, Dharel (7 January 2015). "What you should know about Pope Francis' PH visit". ^ a b Ramos, Roy; Glang, Hader (6 January 2015). "Security bolstered for Pope's Philippines visit". ^ Esmaquel, Paterno II (7 July 2014). "Pope chooses Visayas as core of Philippine trip". ^ Esmaquel II, Paterno (24 March 2015). "Pope Francis hails 'Lolo Kiko' nickname". Rappler. Retrieved 23 June 2015. ^ a b "The Theme: Mercy and Compassion". Papal Visit to the Philippines 2015. Retrieved 8 January 2015. ^ Viehland, N.J. (11 July 2014). "Philippine bishops' conference launches theme of Pope Francis' 2015 visit". ^ "Gov't seeks foreign assistance to prevent possible attack against Pope". ^ Tuyay, Francisco; Apolonio, Eric; Barcelo, Vito; Rada, Julito; Cruz, Maricel; Araja, Rio (14 January 2015). "CIA agents join Vatican in effort to secure pope". ^ a b Laude, Jaime (22 January 2015). "JI plot: Why cell signals turned off during Pope visit". The Philippine Star (ABS-CBN News). Retrieved 22 January 2015. ^ Ramirez, Robertzon; Sy Egco, Joel Sr. (2 January 2015). "Thousands of barriers erected for papal sit". The Manila Times. Retrieved 17 January 2015. ^ Dinglasan, Rouchelle (11 January 2015). "16,000 volunteers to form human barricade for Pope in Manila 16,000 volunteers to form human barricade for Pope in Manila". GMA News. Retrieved 17 January 2015. ^ "WATCH: 'We Are All God's Children,' official theme song for 2015 Papal Visit". ^ "Jamie Rivera - We Are All God's Children (Official Music Video)". ^ "Pope Francis arrives in Philippines". ^ a b c d e Dioquino, Rose-An Jessica; Perez, Analyn (7 January 2015). "Pope Francis in the Philippines: Official itinerary". ^ "Pope Francis en route to the Philippines". ^ Cardinoza, Garbriel; Roque, Anselmo (11 January 2015). "Pealing of church bells to welcome Pope Francis in PH". 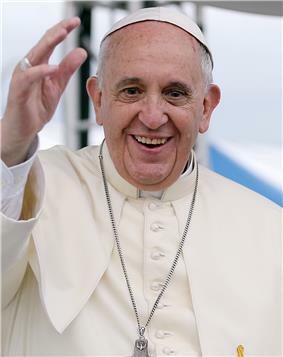 ^ "15-minute ringing of church bells ordered upon Pope Francis arrival in the country". ^ a b c "Thousands of school children welcome Pope Francis in PH". ^ Ramirez, Robertzon (9 December 2014). "Pope to stay at Manila". ^ a b de Lara, Ivan Angelo (16 January 2015). "Why Pope Francis didn’t ride popemobile on the way to Malacañang". ^ Calonzo, Andreo (16 January 2015). "PNoy criticizes Filipino clergy in front of Pope Francis". GMA News. Retrieved 17 January 2015. ^ Mogato, Manuel (16 January 2015). "With Pope's ear, Philippines president rebukes clergy over hair joke". Reuters. Retrieved 17 January 2015. ^ a b "Netizens praise Pope, hit Aquino over speeches". Rappler. 16 January 2015. Retrieved 17 January 2015. ^ "Malacanang speech: Pope urges Cabinet officials, politikos to reject corruption". Politiko. 16 January 2015. Retrieved 16 January 2015. ^ a b "Pope Francis calls for integrity in Philippine leaders". DPA International. 16 January 2015. Retrieved 16 January 2015. ^ a b Torres-Tupas, Tetch (16 January 2015). "Pope Francis breaks protocol on his way out of Manila Cathedral". ^ Delacruz, Nirva’ana Ella (20 November 2014). Show us how to be good' – former street kids to Pope"'". ^ "Street kids meet pope in surprise, private encounter". ^ Macas, Trisha (17 November 2014). "Only 2,000 attendees allowed for Pope Francis' Mass at Manila Cathedral". ^ "Pope highlights Church's role vs inequality, injustice". ^ Macairan, Evelyn (13 December 2014). "Best seats in meet with pope reserved for poor". ^ Ranada, Pia (16 January 2015). "Pope in Another surprise: Pope Francis meets with Filipino Jesuits". Rappler. Retrieved 17 January 2015. ^ Diola, Camille (17 January 2015). "Pope Francis arrives in rainy, windy Tacloban". ^ a b "Storm forces Pope Francis to shorten Leyte visit". Rappler. 17 January 2015. Retrieved 17 January 2015. ^ a b Fernandez, Amanda (17 January 2015). "Woman dies in freak accident after Tacloban papal Mass". GMA News. Retrieved 17 January 2015. ^ Cayabyab, Marc Jason (15 January 2015). "Modest 'sawali' stage for Pope Francis Mass in Tacloban". ^ Arnaiz, Vicky C. (26 November 2014). "Waray songs to be sung at papal mass in Tacloban". ^ Arnaiz, Vicky C. (17 January 2015). "Homily of Pope Francis at Tacloban Airport". ^ Locsin, Joel (21 June 2014). "Complex for Yolanda victims to be named after Pope Francis". ^ Billones, Mia. "Pope Francis Center in Leyte shelters 'Ruby' evacuees". ^ a b Dinglasan, Rouchelle (17 January 2015). "Pope Francis safely lands in Manila after shortened trip in Leyte". GMA News. Retrieved 17 January 2015. ^ Manalastas, Jester; Legaspi, Jun (15 January 2015). "Taclobanons to welcome Pope Francis –Romualdez". ^ Diola, Camille (17 January 2015). "Pope Francis apologizes for cutting Leyte trip short". The Philippine Star. Retrieved 17 January 2015. ^ Cruz, Vida (18 January 2015). "Pope Francis departs from Nunciature for UST". GMA News. Retrieved 18 January 2015. ^ a b Lozada, Bong (18 January 2015). "Pope meets heads of other religions at UST". Philippine Daily Inquirer. Retrieved 18 January 2015. ^ "Pope Francis in Manila: Pope departs Philippines after record-breaking Mass". BBC News. 19 January 2015. Retrieved 20 January 2015. ^ Hegina, Aries Joseph (18 January 2015). "MMDA: 6M Filipinos attended Pope Francis’ Luneta Mass, papal route". ^ Esguerra, Christian; Brizuela, Maricar (12 January 2015). "Crowd estimate for papal Mass: 6M". ^ Mangosing, Frances (19 January 2015). "Adios: Pope Francis leaves Philippines". ^ a b Basa, Mick (11 January 2015). "Business losses: Papal visit's unintended consequences". Rappler. Retrieved 17 January 2015. ^ Cabacungan, Gil (17 January 2015). "'"Pope's visit 'good for business. Philippine Daily Inquirer. Retrieved 17 January 2015. ^ Tiangco, Jeffrey (3 December 2014). "Street kids rounded up by Pasay DSWD, police". ^ Parry, Simon. "EXCLUSIVE – Children CAGED to keep the streets clean for the Pope: Police round up orphans and chain them in filth during pontiff's visit to Philippines". ^ "Posted in: News Posted: 15 January 2015 Pope Francis' Visit To The Philippines: Street Children Rounded Up, Caged To 'Clean Up' Manila Streets". Inquisitr. 15 January 2015. Retrieved 15 January 2015. ^ Rodriguez, Fritzie. "'"Finding 'Frederico. ^ Rodriguez, Fritzie. "DSWD to shut down facility where Frederico was found". ^ a b "DSWD denies children are caged to keep them off streets; Soliman says street children part of the Papal Visit". ^ a b c Francisco, Katerina (16 January 2015). "Aquino's speech a commentary on Arroyo years – Tagle". Rappler. Retrieved 17 January 2015. ^ "What Pope Francis told father of girl killed in Tacloban Mass". ^ "Woman dies in freak accident after Tacloban papal Mass". ^ "They're all safe: Ochoa, Coloma on light plane that skidded in Tacloban". ^ "Crash of a Canadair BD-700-1A11 Global 5000 in Tacloban". Bureau of Aircraft Accidents Archives. Retrieved 20 January 2015. ^ "PNP appeals for calm as pilgrims flock to Luneta". ABS-CBNnews.com. 18 January 2015. Retrieved 18 January 2015. A few hours after the mass officiated by the pope in Tacloban, a 27-year-old volunteer named Kristel Mae Padasas working for Catholic Relief Services died at the Daniel Z. Romualdez Airport after scaffoldings near the altar fell on her. On January 17, 2015, a Bombardier Global Express plane carrying several Cabinet secretaries of President Benigno Aquino III skidded off the runway of Daniel Z. Romualdez Airport in Tacloban. All the 12 passengers and 3 crew members were safe. The plane bears the aircraft registration, RP-C9363 and was operated by Challenger Aero Corporation Metro Manila. Ten people suffered minor injuries after an early Sunday morning scuffle broke out at an entrance to the Quirino Grandstand after a group of attendees to the pope's final mass became impatient and tried to gain entry to the venue. Vatican spokesman Father Federico Lombardi described the speech as "rather original because there is not always such a speech during the formal ceremonies of reception of the Pope". Lombardi also added that the speech was also "very interesting" and showed "two different perspectives"; One of "the politician and of the Pope". Cardinal Luis Tagle described Aquino's speech as a "commentary of previous administration". He noted that many speeches made by Aquino since his presidency referred to the previous administration of Gloria Macapagal Arroyo and how he inherited some issues left by his predecessor. Tagle also stated "I think [Aquino] was coming from a deeply personal experience and also a deeply political experience. The personal experience that shaped that type of interpretation of facts was his own suffering during martial law and his appreciation for role of Church during that time," Tagle was quick to add that focus of the public must be directed at the papal visit since the issue regarding Aquino's speech can be explored after the visit. President Benigno Aquino III's speech at the Malacañang Palace during his courtesy call with Pope Francis turned out to be controversial, drawing mixed response from netizens. Aquino criticized the local Church for its inaction against the "past administration's abuses" which was interpreted as a reference to former President Gloria Macapagal-Arroyo. Some netizens praised Aquino's honesty while some called Aquino's speech inappropriate and criticized the timing of Aquino's criticism. On January 16, Department of Social Welfare and Development (DSWD) secretary Dinky Soliman denied the reports and asserts that the government does not tolerate such practices reported by MailOnline. Soliman also says that the photos published by the report concerned were photos taken in the past. Soliman said that "Corrective measures have been undertaken since the time that the reports came out." She pointed at a photo of a child, named Federico who was shown to be malnourished. The photo was in fact taken in 2014, nearly 7 months after the child's admission to the Reception and Action Center, and had previously appeared in other international news articles focusing on conditions in the center. “Federico has already gained weight and is being cared for by an NGO with DSWD. We have found his mother and we are currently doing case work management with the mother,” Soliman said. MailOnline made an exclusive report on January 14 about alleged children rights violations in Manila in relation to preparations for the papal visit. Philippine police authorities were reported to round up street children some as young as five years old around Metro Manila and send them to detention centers alongside with adults. Detained children were reported to be treated poorly, suffering from physical and sexual abuse, starvation, denied an education and denied basic human dignity. Children who attempted to escape are reportedly chained into pillars if caught. Officials through Pasay City Social Welfare Department chief, Rosalinda Orobia, in response to an inquiry by Manila Standard, asserts that they are rounding up street children to protect the pope from street children gangs. Orabia also said that such actions were done to prevent the gangs from taking advantage of the pope. Manila Standard criticized Orobia's statement claiming that the authorities were more concerned with making the city presentable to the pope on his visit. Father Shay Cullen, who works with street children commented "Sadly, there is no way the Pope will be visiting these detention centers in Manila. They are a shame on the nation. Officials here would be horrified at the prospect of the Pope seeing children treated in this way". Stockbroker Wilson Sy, who manages the Philequity Fund, says that while the papal visit will have minimal direct monetary benefits, it will cause investors to be "reminded" about the country. He noted that Philippine Stock Exchange Index, closed at 7,490.88 on January 14, a record, described by economic analysts as a "papal rally" reflecting positive outlook of local and foreign investors. A successful and peaceful papal visit will increase investor confidence to do business in the country. Security for the visit, including for physical barriers set up along the 11 kilometres (6.8 mi) route from the air base to downtown Manila, is estimated to have cost the government ₱200 million ($4.5 million) . President and CEO of the Philippine Stock Exchange (PSE), Hans Sicat, made calls to the government to halt the addition of holidays as lesser trading days. During the holidays, clearing operations at the Bangko Sentral ng Pilipinas were suspended. However, Sicat said that the central bank agreed to run clearing operations on January 19. Sicat argued that closing during three days of the papal visit would cost the government ₱14 million ($311,457.17) lost in uncollected trading-based government taxes. With the declaration of special non-working holidays in Metro Manila covering the dates, January 15, 16, and 19, the economy was expected to experience lost revenue of millions of dollars. The business sector has criticized the government for adding too many non-working holidays every year. According to a study by the Makati Business Club conducted in 2014, non-working holidays generally cost the electronics industry ₱1.2 billion (US$26.70 million) per day, citing figures from SEIPI. While the holiday declaration is not nationwide, workers wanting to see the pope will take leaves adding labor cost strains to businesses. Pope Francis attended a leave-taking ceremony at the Presidential Pavilion in Villamor Air Base, where he was sent-off by President Benigno Aquino III, his Cabinet secretaries, and a number of Catholic bishops, before flying back to Rome. The pope departed Manila at 10:12 am PST on a chartered Philippine Airlines Airbus A340-300. At the Quirino Grandstand in Luneta Park, the pope held his third and concluding mass in the Philippines. The Metro Manila Development Authority said approximately six million people attended the event, exceeding the number of five million attendees during Pope John Paul II's World Youth Day Mass at the same venue in 1995, making the attendance the largest papal gathering in history. After the mass, the crowd sang the 1995 World Youth Day anthem, "Tell the World of His Love", followed by the visit's official theme song, "We Are All God's Children (song)", led by Jamie Rivera. After the meeting, Pope Francis rode the "popemobile", circled around the university, and later met with at least thousands of youth who gathered at the university. About 24,000 youth representatives gathered at the University of Santo Tomas Field near the Grandstand. People from the general public were also present within other parts of the university. 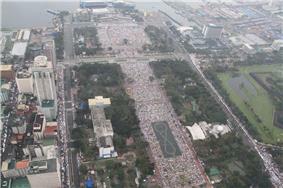 Aerial shot of Rizal Park, Manila, Philippines during the public Mass, January 18, 2015. The pope arrived back at Villamor Air Base in Manila at around 2:00 pm PST. Francis was received by high-ranking officials of the Armed Forces of the Philippines and the Philippine National Police together with their families. Children and the sick lining along the apron were also blessed by the pope. He had lunch with survivors of Typhoon Haiyan (Yolanda) and the earlier Bohol earthquake at the Archbishop's Residence in Palo. 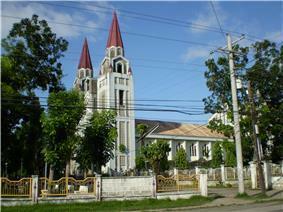 The Pope Francis Center for the Poor also in Palo was blessed by the pope himself during his visit. The facility funded by the Pontifical Council Cor Unum has a clinic, a chapel, a home for the elderly and sick and an orphanage. Construction of the facility was completed in December 2014 after five months of work. The pope had a brief meeting with seminarians, priests, religious community members and families of the survivors of Typhoon Haiyan at the Palo Cathedral and blessed a mass grave of those who were killed due to the typhoon. Francis departed from Tacloban at exactly 1:07 pm PST to Manila. The pope was originally scheduled to depart at 5:00 pm PST. The pope apologized for leaving earlier than scheduled. Pope Francis departed from Villamor Air Base at 7:37 am PST for Daniel Z. Romualdez Airport in Tacloban, Leyte on a chartered Airbus A320 flight operated by Philippine Airlines, arriving in Tacloban at approximately 8:50 am PST, where he was welcomed by Palo Archbishop John F. Du. The pope's trip to Leyte was shortened as decided by the Vatican due to Tropical Storm Mekkhala (Amang). Leyte had been placed under storm signal no. 2 earlier in the morning by the Philippine Atmospheric, Geophysical and Astronomical Services Administration. 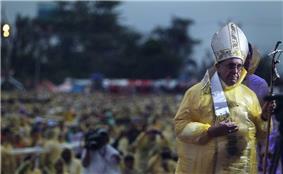 The pontiff held a Holy Mass on a stage which was set up at the Tacloban airport. The stage, specifically made for the papal Mass, is primarily made of sawali or bamboo mats. Among the languages used during the Mass were Waray, Cebuano, English, Filipino, Hiligaynon, Latin, and Spanish. Pope Francis visits one of the Typhoon Haiyan victims in Palo, Leyte. Pope Francis celebrates Mass amidst heavy rains and strong winds near the Tacloban Airport. Back at the Apostolic Nunciature, Pope Francis, a Jesuit himself, accommodated 40 Filipino Jesuits. The Filipino Jesuits were privately informed of the meeting and only disclosed the meeting to the public after the gathering itself.